Bengal, especially Kolkata, has a vibrant food scene marked by an assortment of complex food cultures and practices, a site where complex rhetorical struggles between the national and the colonial are played out. Here, cooking and eating transcend their functionality and become a cultural site on which the differences between the colonizers–both Mughal and English–and the Indian subjects are maintained. Therefore, the Bengali household kitchens have historically been implicated in the construction and execution of a Bengali cultural identity, while the commercial kitchens–restaurants, cafes, or even weddings–have maintained and extended the colonial influences. In other words, in Bengal, there is a clear demarcation between what we eat at home and what we eat out. 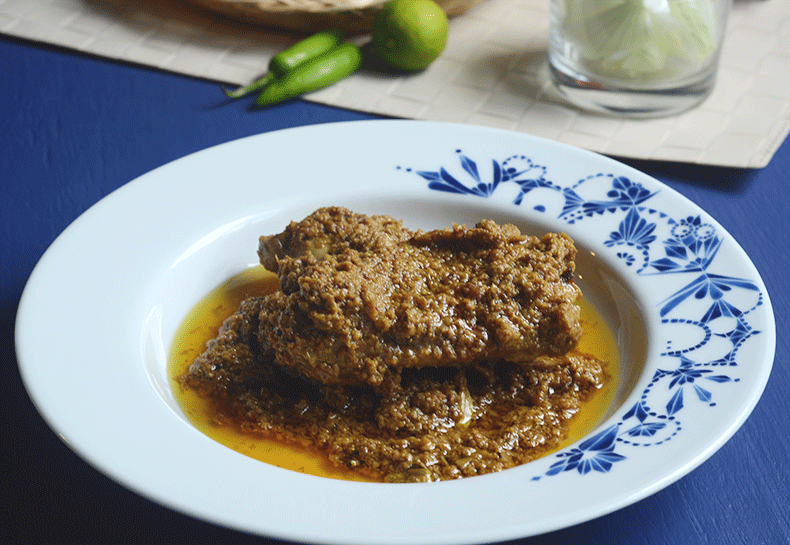 Before the emergence of the Bengali restaurant scene is Bengal (a fairly recent phenomenon) our restaurant visits were limited to either Chinese, or Mughlai, or Continental cuisines, and biriyanis, or kebabs, or chili chickens, or sizzlers never made it to the domestic kitchens. 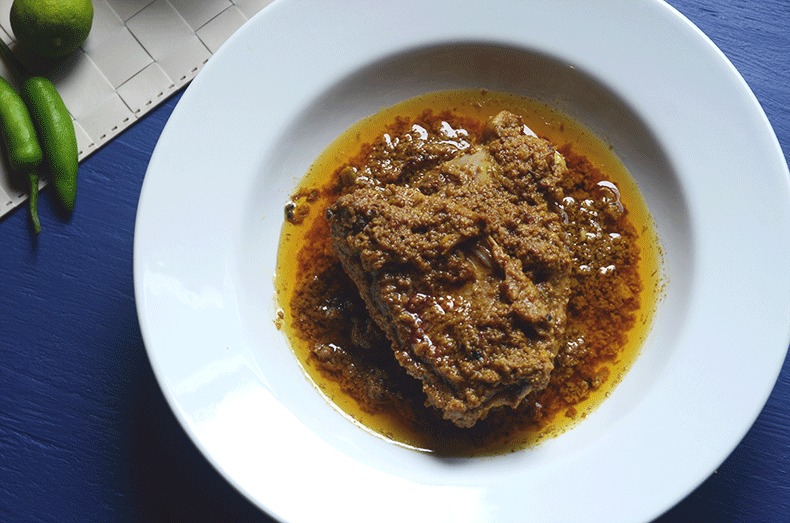 Chicken Chaanp is one such restaurant dish that stands witness to the complex histories of cultural intimacy. It is by no accident that chicken chaanp recipe remains so conspicuously absent from Indian/Bengali cook books. 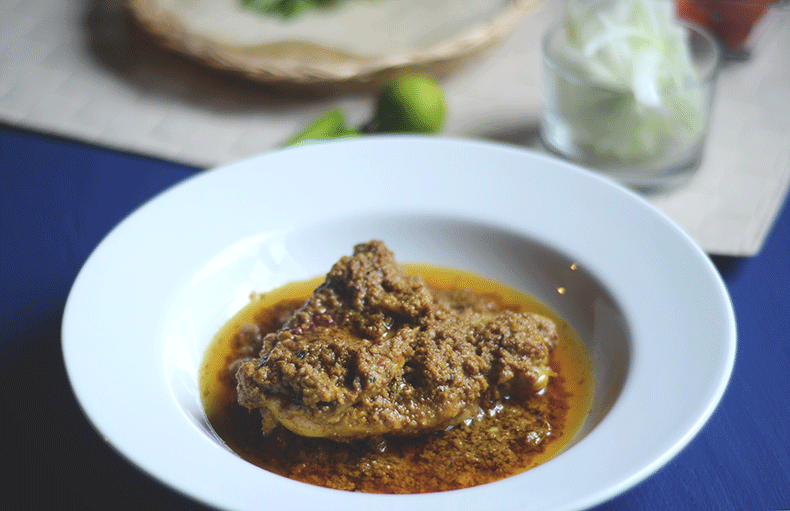 This blog post is a humble attempt to give this dish its rightful place in the domestic Bengali kitchen. But any great cuisine has to judiciously modify with changing times and needs of the ‘modern’ kitchen. And I try to do just that with this recipe. Instead of using 10 measures of ghee that go in the traditional recipe, I put in just two. Although not traditionally used, I use a little onion to make up for the lost amount of ghee. This old-school cooking adapted to a newer audience is really the way forward for so many of our regional and heritage cuisines. In a large bowl mix saffron and lukewarm water and let sit for 5 minutes. Add garam masala, red chili powder, ginger paste, garlic paste, onion paste, cashew nuts paste, gram flour, yogurt, rose water, kewra water, mitha itar and salt and mix well using a wire whisk. Evenly coat the chicken pieces with the spice marinade, cover with a cling wrap and refrigerate for 2 hours. Heat the ghee and oil in a large, thick, and flat bottomed pan and fry the chicken pieces, stirring occasionally, over low heat for 45 minutes to an hour. Sprinkle the saffron water just before taking the chicken off the heat. Serve with rumali roti or naan. What should I do with the saffron water? When do I add it?